JOE Strummer is seven years dead today, and we are much worse for it. No one pop star ever touched me more than Strummage and never a week goes by without listening to The Clash or his four 'solo' albums. I wrote this interview a month prior to his death for the Liverpool ECHO. It's a rubbish interview because I was overawed speaking to a hero, I hope I did him justice. He even phoned me a day later to make sure I had got the pictures his wife was sending for it. I was feeding our daughter Ella her brekkie when I took the call, I dropped Weetabix all over the floor. THE voice is as enthusiastic and passionate as it ever was, the beliefs as idealistic as they ever were. Joe Strummer's back in town and he ain't changed a bit. Leader of punk deities the Clash, musical pioneer, political idealist and doting father, Strummer remains undimmed by the slings and arrows of 25 years outrageous fortune in the music industry. And, excited punk rock pop pickers, he's heading our way. On the phone from his West Country home, the man born John Mellor in Turkey 50 years ago is looking forward to coming back to Liverpool, a city which took the Clash to its bosom like no other. But more of the nostalgia later. This time he's bringing his band, the Mescaleros, back to town next Friday at Liverpool University's small but perfectly formed Stanley theatre. Strummer and his young band have recorded a couple of critically acclaimed albums (Pop Art And The X-Ray Style from 1999 and last year's Global A Go-Go) and won rave live reviews since the great man came back from nearly a decade of self-imposed showbiz exile three years ago. They rip through a handful of Clash classics every night and augment these punk favourites with the best tracks from the two albums, as well as throwing in the odd new song or reggae cover. And how would you describe the new songs? Well, deep breath now, it's an interesting mixture of pop, blues, reggae, dance dub and African jive. It's infectious and irresistible for anyone with a passing interest in quality sounds. This time around they are hitting the university with the intention of honing a set ready for recording a new album early in the New Year. Cue Joe, rapping quickly and enthusiastically about the vibe in the band. He says: "We were out in Japan and America and we were really rocking, blowing crowds away with the new songs. So I wanted to get it back out on the road again and bash the songs out and make them stronger before we get in to the studio. "The new songs are mutating, and becoming more human because we are banging them out without fussing. "Playing live is a part of the process; we aren't interested in making something pristine, we want to bash the songs out before we get into the studio. "But what I have learned is that when you are on a roll like this and the vibe is right you have to keep riding it; the only time we ever managed to do it before was with (legendary Clash triple album) Sandinista." Clang! That there, folks, is the sound of the Clash name being dropped, and it's a musical legacy you can't ignore when interviewing the great one. Liverpool loves him and he loves us. 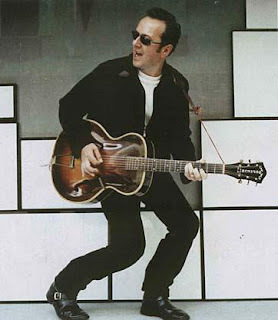 Heck, Liverpool is practically home territory for Strummer, who made his long-awaited return to the stage at a legendary show at the now closed Cumberland Street venue the Lomax in 1999. But for many an ex-punk about town, a Clash show at Eric's in 1978 was the high water mark for both the band and the movement. Joe adds: "We had some great shows in Eric's where it really went off, they were brilliant nights where we really rocked the house. "We loved Eric's and loved playing Liverpool." In fact Eric's in 1978 can claim to be the most packed show of all time - the club only held a couple of hundred people, but up to 10,000 claim to have been present. Despite these nostalgic waxings there was no place for the Clash on the cheap TV celebrations of the 25th anniversary of the birth of British punk. As middle-aged men and women rehashed a quarter of a century-old anecdotes, Strummer and his band mates Mick Jones, Topper Headon and Paul Simenon kept a dignified silence. Strummer simply says: "That's all false memory syndrome. I don't want to look back, I want to keep going forward, I still have something to say to people. "I don't want to be seen as one of the Searchers, doing the same things over and over again. But until then, I'll just keep going." There is no chance of a potentially multi-million dollar reunion of the Clash, but they are still the band most revered by the current crop of garage groups. On top this of their 1979 classic London Calling has been voted one of the top 10 singles of all time by music bible NME. Joe says: "That's better than money or anything else in this job - that's respect, the fact that these great bands acknowledge a debt to us. That's fantastic." So that's Joe , punk rock Godfather and a man of the people. * Joe Strummer and the Mescaleros, Stanley Theatre, Liverpool University, Friday, November 22.